A new construction 55 metre Amels motor yacht, one of the yard’s 180 Limited Editions, has been sold with Will Christie at Y.CO introducing the buyer. To be built in steel and aluminium with exterior design by Tim Heywood, she is the latest hull in the Amels Limited Edition series first announced at the 2005 Monaco Yacht Show and is due for delivery in May 2020. An extended version of the 177 model, she offers an enlarged sun deck which is now 25 metres long and has 155 square meters of relaxation space. The sun deck also accommodates a touch-and-go helipad, which becomes part of the guest area when not in use. “The owner will be exploring many destinations around the world. 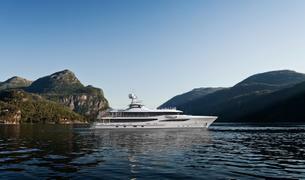 He wanted a yacht that was built to travel the world and that is exactly what Amels Limited Editions Yacht offer. It’s been a pleasure working with Will Christie and the Y.CO team again and we’re looking forward to delivering this new Amels yacht to her owner in 2020,” comments Rutger Dolk, sales manager at Amels. Standout features of the Amels 180 include a bridge deck sky lounge and main deck owner’s suite, complete with a folding balcony. Accommodation on the Limited Editions 180 is for 12 guests split across six cabins, while the crew quarters allow for a staff of up to 12. The asking price of the Amels 180 has been withheld.